A decline in bees and global warming are having a damaging effect on the pollination of plants, new research claims. The "pollination deficit" could see a dramatic reduction in the yield from crops. The research, carried out in the Rocky Mountains, Colorado, is the first to show that the effect is real and serves as a "warning" to Britain which if anything has seen an even greater decline in bees and pollinators. "This serves as a warning to other countries," said Professor James Thomson at the University of Toronto, who carried out the research. "For quite some time people have been suggesting that pollinators are in decline and that this could have an effect on pollination. "I believe that this is the first real demonstration that pollination levels are getting worse. I believe it is a significant decline. I believe the pollination levels have dropped by as much as 50 per cent. "Bee numbers may have declined at our research site, but we suspect that a climate-driven mismatch between the times when flowers open and when bees emerge from hibernation is a more important factor." Butterflies and other insects are also in decline due to habitat loss and climate change. The situation is so serious that the government has launched a £10 million project to find out what is causing bees and other insects to disappear. It is estimated bees are responsible for one in three mouthfuls of our food, and that insect pollinators contribute £440 million to the British economy through their role in fertilising crops. For the latest study, Prof Thomson carried out a 17-year examination of the wild lily in the Rocky Mountains. 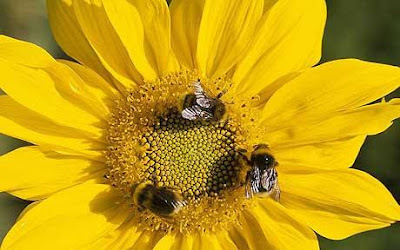 It is one of the longest-term studies of pollination ever done. It reveals a progressive decline in pollination over the years, with particularly noteworthy pollination deficits early in the season. The study will be published in Philosophical Transactions of the Royal Society B: Biological Sciences. Three times each year, Prof Thomson compared the fruiting rate of unmanipulated flowers to that of flowers that are supplementally pollinated by hand. "Early in the year, when bumble bee queens are still hibernating, the fruiting rates are especially low," he says. "This is sobering because it suggests that pollination is vulnerable even in a relatively pristine environment that is free of pesticides and human disturbance but still subject to climate change." Prof Thomson began his long-term studies in the late 1980s after purchasing a remote plot of land and building a log cabin in the middle of a meadow full of glacier lilies.